If you want to see more of Italy than just Rome, this is the trip for you. 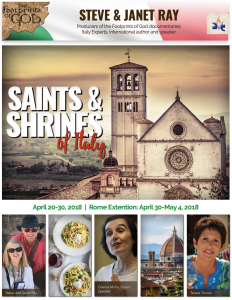 We start in the north and work our way south through Milan, Pavia, Florence, Sienna, Assisi, San Giovanni Rotundo, Loreto, Manoppello, Lanciano and more – finally arriving for the highlights of Rome. This pilgrimage begins April 21 with beautiful Spring weather. Teresa Tomeo will be joining us. To see the incredible itinerary and interactive map, along with info on registering, click HERE. 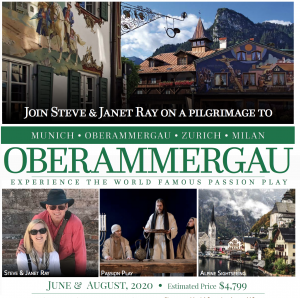 To see our other trips, including the Passion Play in Oberammergau Germany, Poland, Ireland, Mexico, Jordan, St. Paul Mediterranean Cruise and of course the Holy Land and more, click HERE. We will not be doing another Italy or Rome trip for a couple years because of all the others spectacular places we will be visiting in 2019 and 2012.